The God of War games routinely place the player directly into the action from the very beginning. 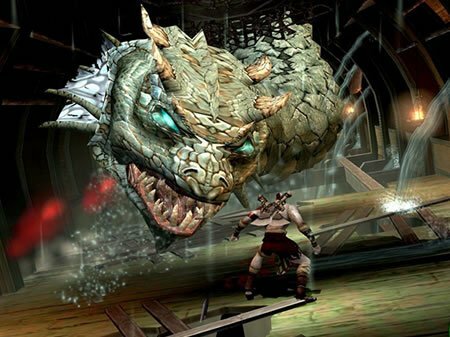 This precedent was made with the first God of War game, seeing protagonist Kratos' fleet of ships under attack by the mythological beast, the Hydra, and it's as memorable an encounter now as it was over a decade ago. As Kratos maneuvers between ships, the Hydra attacks. 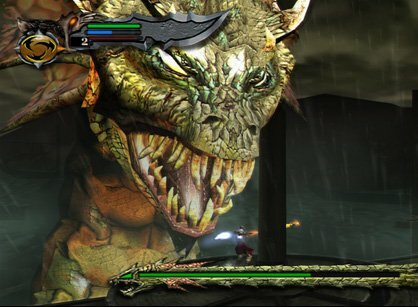 There are two notable encounters Kratos has with the Hydra. The first has him inside the deck of a ship where a head of the Hydra smashes through as an uninvited guest. With his blades unleashed from his arms, Kratos slices and dices the head until it retreats. The second encounter is the final one and most notable. Through taking on three heads at the same time, including the main one, the Hydra King, Kratos shows his godlike battle skills. When the Hydra King's head is destroyed, the others will fall. That's exactly what Kratos does through driving the ship's mast right through the King's head, capping off an action-packed intro to the original God of War with tremendous effect. With Resident Evil VII: Biohazard having been released not too long ago, why not delve back into one of the entries in the Resident Evil series with the greatest impact and one of the greatest games of all time with Resident Evil 4? The game is essentially divided up between three sections: the village, the castle, and the island. Each section concludes with an important boss battle. We'll be focusing on the castle section's ultimate encounter, the fight against the monstrosity that Ramon Salazar turns into. Following multiple radio calls on hero Leon S. Kennedy's frequency due to Salazar's ability to intercept the transmission, where he frequently mocks and tells Kennedy to surrender, the two meet to end the fun and games and finally face off. Using the Queen Plaga to merge himself with his sole monstrous bodyguard (Leon had previously defeated the other in an earlier encounter), Salazar transforms into a parasitic botanist's nightmare of a creature that towers over Leon. The mutation sports four tentacles, two on each side, and possesses a lengthy neck where at the head, a swollen eye-- the weak point of the monster-- rests. With enough rounds pelted in into the eye, Salazar's mutated self is exposed, allowing Leon to get revenge on the trickster for the all the perils he put him through during his stay at his castle. Resident Evil 4 sports many fantastic battles, though they also support the idea that the series had taken a more action-oriented approach that many older fans of the franchise didn't really like or even approve of. Still, the battle with Salazar's towering plant-like mutation made for a really tense and thrilling battle. 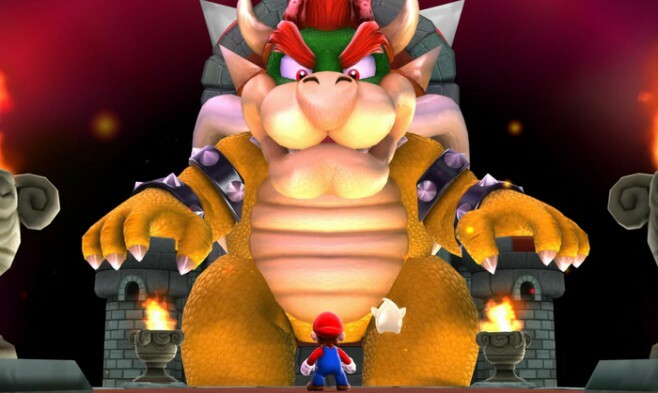 It's not a Super Mario series game if it doesn't have Bowser as a usually impressive and fun final boss! ...Well, unless it's Super Mario Bros. 2.... or Super Mario Land... or... Dammit! You get the point! With Super Mario Galaxy 2, Bowser returns with a vengeance and an innovative boss battle that successfully uses one of Galaxy 2's concepts for it. The battle takes places on a sphere planetoid that Mario can run on all sides of. Meanwhile, a mega-sized Bowser hovers around the planet, summoning meteors to smash into it, as well as slamming his massive fist into the planet, resulting in aftershocks, and breathing fire to put the sizzle into Mario. However, when Bowser slams his fist into the planet while there are still meteors implanted into it, the meteors rise and turn into spheres that with the right angle, Mario can ground pound on them, slamming them into Bowser to deal damage. 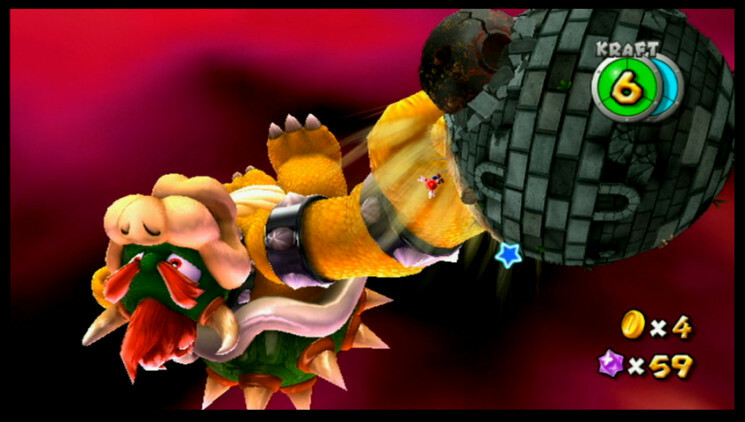 After enough meteors have careened into Bowser, the fight is over and Bowser futilely tries to grab the Grand Star before falling into the abyss. What follows after a scene of short-lived peace with Mario and the newly rescued Princess Peach is a final boss battle which is too short to recommend, though this theme that plays during it surely makes it epic. Though, again, it's too short to hear much of it and for the fight to be fully recommended. 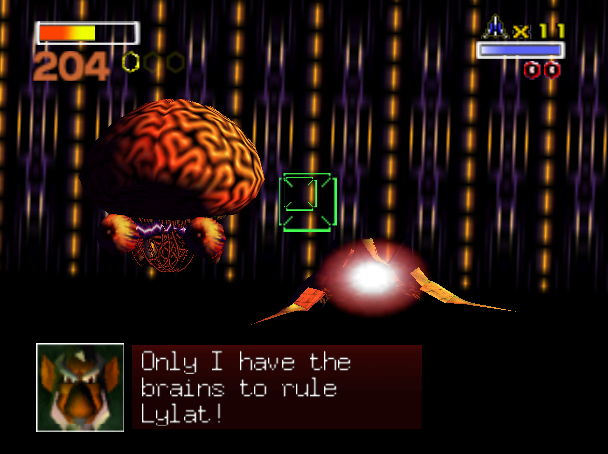 Regardless of which version of Star Fox 64 you play, whether the Nintendo 64 original or its Nintendo 3DS remake, you're going to hear that only Andross has the brains to control the Lylat. Of course, he's rather full of it, as no one with serious brains would have such a wide open weak point to attack. After Fox McCloud goes it solo into the lair of Andross once Team Star Fox takes out their rivals, Star Wolf, he moves through a series of corridors, choosing which ones to go through, hoping to get lucky with some helpful power-ups along the way. Finally, Fox takes on the giant face of Andross. However, we're not focusing on that initial encounter. We're talking about the second phase of battle, the one that is only available by reaching Venom from Area 6. Once Andross's giant head (apparently to match his ego) has exploded after defeat, what is left of him is a brain with two eyes that are connected via jagged laser beams. Fox must pilot his Arwing with great precision to shoot down the speedy eyeballs and then get ready for the true showdown. Andross' brain will follow Fox, hoping to get his Arwing caught in the minutia underneath the brain, which will cause serious damage to the Arwing, even resulting in a lost wing on expert difficulty. With precision flying, Fox needs to shoot at the underside of the brain, the back of it, where the weak point is. This means players should have a mastery of the U-turn, hoping to not fly backward into the brain. That said, shooting the brain won't cause damage to Andross, but it will cause him to teleport away. Once the brain's weak point has taken enough damage, Andross makes one last move, taking Fox with him in his destruction. However, after some silence and a familiar voice pushing Fox to "never give up," a climactic escape from Andross' base is made, and once completed, Team Star Fox's mission has been accomplished. Bowser and Sigma have probably been the bosses with the most representation on SuperPhillip Central's Best Boss Battles in Gaming History. This continues with X's final encounter with Sigma in Mega Man X3. 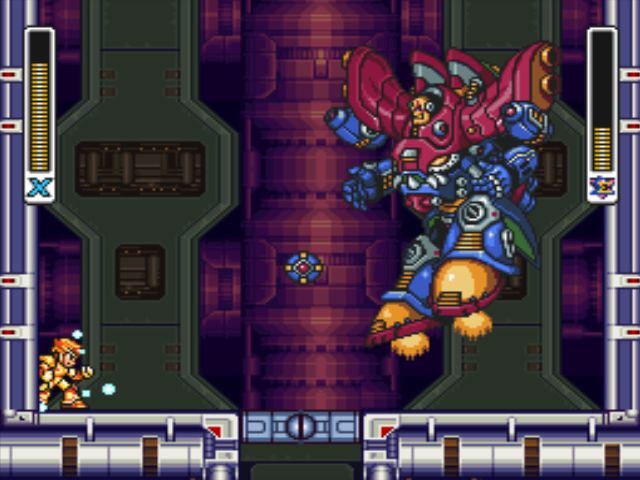 After X defeats the Captain America-like shield-throwing incarnation of Sigma, the Reploid behind the Maverick movement reveals a massive mech body, serving as X's ultimate challenge in Mega Man X3. The mech's movement pattern has it firmly planting its feet to the ground, unleashing attacks like a huge conic beam from its cannon, multiple mines, and a surplus of missiles, and then hovering up from the ground, moving across the battlefield, before once again falling to the ground. The mech's weak point is Sigma's head itself that is an admittedly smart target compared to the hulk that is the actual robotic body. Even after the war of attrition is over, one that is due to how much health and defense Kaiser Sigma possesses, the game isn't quite finished yet. X must make his way up a chasm through wall climbing while a rising tide of lava and Sigma's virus form pursue. Once at the top, a friendly face will slice into the Sigma virus, effectively defeating it, and resulting in a job well done.